Our company has earned great appreciation in the market for manufacturing a wide range of ESD Safe Area that are widely used for various applications in Clean rooms, Electronics manufacturing assembly, Test areas and Computer and electronic equipment installations. These are manufactured using latest technology that ensures reliable and durable performance of our range of ESD Tiles, ESD Rubber Mat, Antistatic PVC Mat and ESD Work Stations. We have also achieved expertise in the sphere of offering a wide range of ESD Rubber Mats that are fabricated with a conductive material and compound rubber. It avoid the static charge built up on the body, clothes and any tools when it is laid on a shelf or on the floor and connected to the Earth grounding point. 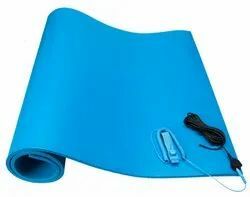 Leveraging on our industrial experience and robust infrastructure, we have also been able to manufacture a wide range of Antistatic PVC Mats. These are three layered homogeneous and flexible vinyl flooring that are manufactured using latest calendaring technology form South Korea. We offer a wide range of ESD Tiles that contains conductive elements of the carbon family that are randomly but precisely distributed throughout the tile to provide through-tile conductivity. These are widely used for providing a solution to static discharges in today's technological environments. We have designed and manufactured a wide range of ESD Work Stations that secure technical electronic workstation and provides the utmost in versatility, aesthetically pleasing design and productivity. 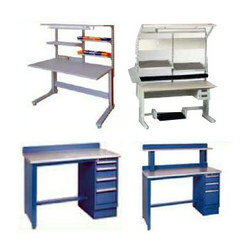 These are widely used in test, service, repair and quality.